Summer Is On The Way, And So Is The Stone Fruit! Author Table & FieldPosted on May 20, 2015 Categories classes, Dessert, fullerton, Jonathan Dye, recipes, Thursdays in the Kitchen, UncategorizedTags cake, Fullerton arboretum, jonathan duffy davis, jonathan dye, nectarine, nectarines coffe cake, pinion, plum cake, plum pin, recipe, stone fruit, streusel, thursdays in the kitchenLeave a comment on Summer Is On The Way, And So Is The Stone Fruit! New Classes! The Jonathans are Returning to the Arboretum Kitchen! We are so pleased to announce that Jonathan Duffy Davis and Jonathan Dye will be returning to the Fullerton Arboretum for ongoing demonstration style cooking classes this Spring and Summer! Beginning this Thursday, April 23rd, the Jonathans will bring you insightful menus, dedicated instruction and lots of fun in a selection of monthly classes. For anyone who has not attended these classes in the past, know that they include both an evening of detailed and entertaining instruction, as well as a full multi-course dinner in the form of the menu being taught. Classes make for a great night out, so tell your friends, sign up now and save the dates! Author Table & FieldPosted on April 19, 2015 Categories classes, fullerton, Jonathan Duffy Davis, Jonathan Dye, Thursdays in the Kitchen, UncategorizedTags cooking class, fullerton, Fullerton arboretumLeave a comment on New Classes! The Jonathans are Returning to the Arboretum Kitchen! 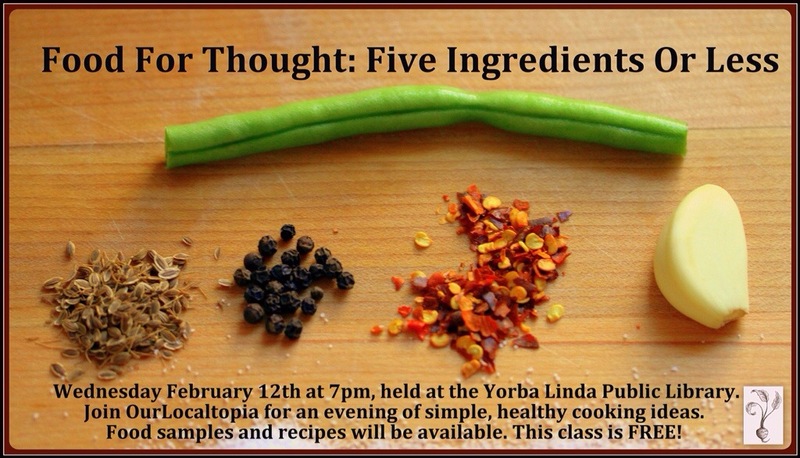 This Wednesday (April 30th), OurLocaltopia is back at the Yorba Linda Public Library for a free class on cooking with fresh herbs! Join us in the downstairs community room at 7pm and enjoy an evening of culinary eduction and demonstration taught by Jonathan Dye and Jonathan Duffy Davis. Samples of the food prepared will be available for tasting and copies of the recipes will be passed out. Come one, come all!